Access your desktop any where, any time, and from almost any device with an internet connection. Your desktops are designed and configured to meet your specific needs. Your IT team can focus on high priority needs while Ongoing Operations’ Cloudworks takes care of the rest. A highly trained team manages all the complexities of IT and they bring you solutions that meet your specific business needs. Ongoing Operations has over 10 years of experience with cloud computing across several types of business and industries. We understand the challenges for small to medium size business and what IT services provide the greatest benefits. 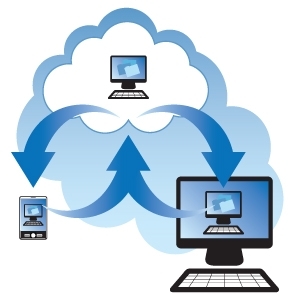 With hosted virtual desktop you no longer need to purchase and maintain equipment. All the hassles are removed and all you need to do is call our help desk for support. We take care of the rest. You only pay for the services you use. A detailed invoice is provided each month outlining all the services so you can establish a more predictable budget. If your business experiences seasonality in requirements for IT resources, you can quickly scale to meet those needs. Network uptime guarantee 99.9% Redundant systems are in place to reduce risks for downtime. As an Ongoing Operations customer your information is protected: protected from loss, protected from unauthorized access, and protected from environmental conditions that could impact availability. Certifications to validate processes, protocols, and environment meet strict requirements. , PCI, SAS 70/SSAE 16. Want to learn more about Hosted Virtual Desktop Features?